The Defense Committee of Germany’s federal legislature is no longer allowed to discuss the German military’s main weapons systems. For four years, legislators were informed through annual reports about the status of the army. These reports were later made public. But in a letter dated March 11, Germany’s general inspector of the Bundeswehr, Eberhard Zorn, stated that this will now change. For the first time, the report will be kept classified, for security reasons. Addressing the chairman of the German Defense Committee, Zorn wrote: “The main weapons systems of the Bundeswehr at large determine the operational readiness and mission fulfillment of the armed forces.” For this reason, the deputies have, in years past, been thoroughly informed about the readiness of the German Army. This transparency, he further explained, will continue and even be expanded. In future, the report will appear biannually and include five more main battle systems of the military organization domains of cyber and information space. It will also include information about eight systems with special relevance to the Very High Readiness Joint Task Force that Germany will lead in 2019 and other newly developed weapons systems. While the letter emphasized that this report will increase transparency and timeliness, it also stated that the information should, under no circumstances, fall into the hands of unauthorized persons. For this reason, the entire report will be classified at the second-highest level of secrecy. Now only authorized deputies can access the report in the Document Security Office of the German Bundestag. The public will be left in the dark regarding Germany’s true military readiness. “The Ministry of Defense apparently wants to significantly reduce the public flow of information about the condition of their tanks, fighter jets and naval vessels,” wrote Germany’s faz.net. But is this really the reason the military report will be kept secret? In his letter, Zorn admitted that the Bundeswehr had suffered serious deficits in its combat readiness. But he highlighted that various measures have been taken to reverse this trend. As a result, the German Army was able to cope with an increasing number of responsibilities. For example, the German Army contributed a mammoth contingent to nato’s “Trident Juncture” in Norway. Its 50,000 soldiers were second in number only to the host country. “Trident Juncture” is nato’s largest exercise since the end of the Cold War. Due to the German military’s prior deplorable state, few are alarmed by the report’s new classification. Hardly anyone outside of Germany reported on it, and those who did expressed little concern. Many news analysts don’t realize how suddenly and rapidly Germany can transform into a military superpower. The April Trumpet issue’s cover story, “Forging a Superpower,” explains how quickly Germany can arm itself if it restarts its mighty weapons industry. The geopolitical situation has not yet justified such a move, and the topic of Germany’s military is still extremely sensitive. Since the end of World War ii, the German public has opposed rearmament. Recent geopolitical shifts and various reports about the miserable condition of the military have changed that mentality somewhat. But resistance remains. 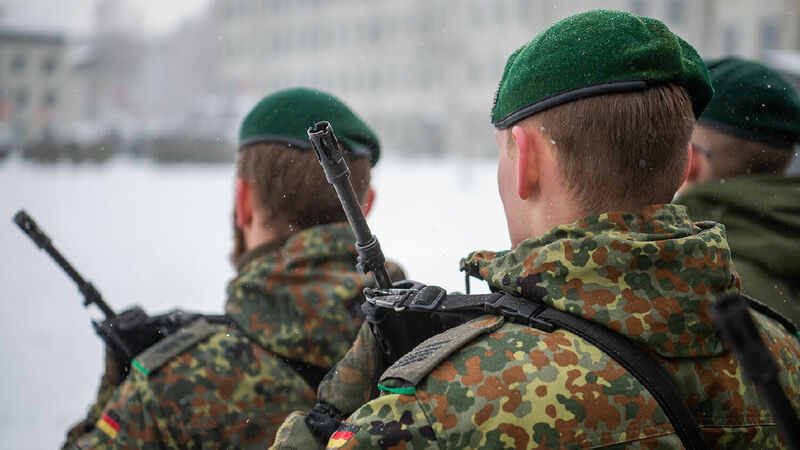 The secrecy of future annual reports will help the German government remilitarize while the public remains under the impression that the German Army is deplorable. Thus, leaking news about German militarization will not sound alarming but will be seen as a necessity. But Germany’s combat readiness will remain hidden until Germany goes to war. While almost no one seems alarmed by this latest development, history gives us a clear indication where these changes are leading. Prior to World War ii, the British Parliament had, in general, been deceived about the German Army’s preparedness until it was too late. But Winston Churchill, who had insider information, had continually warned against Germany’s deceptive tactics. Concerning Germany’s growing air power, he said in a speech on Nov. 28, 1934, “So far, I have dealt with what I believe is the known, but beyond the known there is also the unknown. We hear from all sides of an air development in Germany far in excess of anything which I have stated today. As to that, all I would say is, ‘Beware!’ Germany is a country fertile in military surprises” (emphasis added). We are now entering a time when Western leaders have to again deal with the “unknown” military surprises that Germany may develop underground. While some nations believe in deterrence and exaggeration to prevent war, Germany believes in secrecy and deception to prepare for war. When war breaks out, Germany will have various advantages. Enemy nations will be surprised by its new military technologies and, for the most part, be in the dark about Germany’s true military strength. For example: When Germany overran Poland in World War ii, Europe was shocked by its military power and advances, but it was also oblivious to the fact that Germany used almost its entire strength for the attack, leaving the Western front almost entirely defenseless. Daniel 8 prophesies of a man rising in modern-day Europe just prior to the return of Jesus Christ, the Prince of princes. This man is prophesied to lead a unified European empire of 10 nations, with Germany as the driving force. Considering recent reports about Germany’s military readiness, these prophecies seem almost unbelievable. But history and prophecy show that Europe will again be caught off guard and shocked by Germany’s military surprises just before God intervenes to put an end to the evils of this world. To better understand Germany’s true military potential, read “Forging a Superpower.” Today, we can see striking similarities today with the way Germany rose militarily in World War ii. But you don’t have to be caught off guard by these developments. Request a free copy of Winston S. Churchill: The Watchman to learn how you can use history as your guide to understand Bible prophecy.